Renting to own... My son's first ASCENDER! Thread: Renting to own... My son's first ASCENDER! So at PROLINE by the fire, we all get settled in to camp and getting rigs ready, some already hit the trail. Ernie walks over to me with the rootbeer ford aka the panhard development truck. i check it over, admiring the quality craftsmanship and just in overall awe of the work done to make the capable chassis even more capable. then he says something i almost didn't understand at first. "I would like for your son Andrew to have this." i nearly passed out but held on long enough to utter "thank you so much" and gave him the best hug i could. he explained again why. and if you don't know, he is a BIG believer in paying it forward for the right reason and the right people. i must be doing something right on this earth, and my son must be proof because this is the second codyboy rig to end up in my garage. Ernie and Marcia are like the angels on the rocks. the care and passion they have for this hobby and the friendships made are beautiful. i waited to tell Andrew, who at the time was running his barrage around the camp, waiting for me to get my rig ready. he came back to ask if we can go, and i said yes just one more thing. come over here... i showed him the shiny rootbeer flavored ford sitting next to mine and said "Ernie said that one is yours now." he perked up and said "REALLY?!" then it set in and his eyes welled up (like mine are now) before he could say anything i said "well you should go thank him" he ran to Camp CODYBOY and found Ernie at his bench and gave what Ernie would tell me later "was the longest, best hug he's had in a long time. best payment for that truck"
already have big plans for this. Andrew's ideas are great and i think i can execute them decently. Re: Renting to own... My son's first ASCENDER! And another kid is pretty good too. It doesn't feel like that long ago I was getting a room ready for my son (I was also finishing grad school at the time, not good planning on my part), now he is going to be 3 and is getting his first truck built. Way to keep the RC spreading now and in the future. Can't wait to see what you do to make this great rig even better if that's at all possible besides changing the color? Such an awesome story. Now days you don't hear of such kindness and generosity very often. Wish I could have been there. yup! keeping the theme of "passing it forward", i sacrificed the Holmes ESC from my rig so Andrew could have a running rig. and even better, it now has matching brand motor/esc! not that it matters but i just think its "right". and MAN does it go like stink and hold like hell! i haven't put it on an incline board to test the brake, but my guess is the tires would slide before the drag brake lets go! and that's saying something since this guy is wearing hyrax 4.19! until next time, ascender fam! Last edited by Shinchu; 06-04-2018 at 12:16 PM. Very awesome! Once you get things dialed in we should all go out for an ascender-athon crawl! sounds good to me! one of the lakes in Escondido? gotta see what my weekend looks like. and if i can get my tinytire 79 running. Lake wohlford has some good crawling, so does felicita county Park. Got scale acorn lugs from locked up rc in my cart at rpp! Andrews b day is in August so we should see more goodies around mid month. Looks like it works excellent! I think your son is going to have lots of fun with that! Congrats Andrew! Ernie & Marcia are some of the greatest people on this planet! They helped me into this hobby & I can't thank them enough. I'm jealous you got to meet them in person. Can't wait to see where this rig takes you! Have a great day! great rig, we are both eager to see what scale improvements we can do. i think inner fenders of some sort would make a good start. 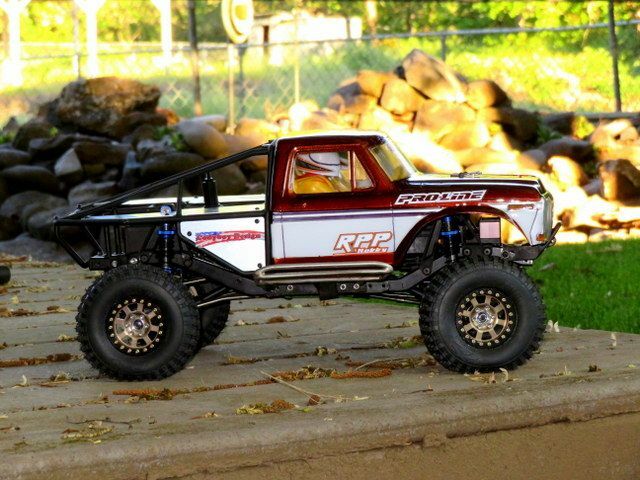 also waiting for the ampro bronco interior or maybe just go RC Nerds and a scratch built floor with bucket racing seats. Andrew wants to load up the bed with scale gear. maybe i'll let him foot the bill for that ;) its easily in his price range. I'm all smiles watching the video Chris, I felt the hug from him all over again. I have a lot of scale gear, ask Andrew what he is looking for and I will see what I have to help out. Ebay is doing 20% off anything for father's day until 7:00 (PT), seems like both you and your son could use a few things. We are planning on shutting down the shop for another 8 weeks the end of September for another adventure across the US so stay tuned. We will be visiting in the Meredith area again for some of that time!!! . I plan on doing another travel log in chit chat so you guys can follow along. Suddenly I feel dad like (even though I'm single and no kids) - I hope they don't check my credentials when I use this coupon code. Proof of paternity was not required when I ordered another Mamba X combo (how could I say no for $160?) but that may be buried in the fine print. It is probably worth the risk though. i honestly cant think of anything?!! maybe a winch? i need to read the fine print but I'm pretty sure its for 1 item not total purchase? looking at that vid though I'm considering some rcaddicts inner fenders. or i could try heating/curving some styrene... just wish i could find it in black. Last edited by Shinchu; 06-06-2018 at 11:36 AM. Its off the total purchase.